What do you get when you have had a long day, arrive home late, your family is starving, and you realize that you forgot to defrost the meat for the enchiladas you planned to make for dinner? 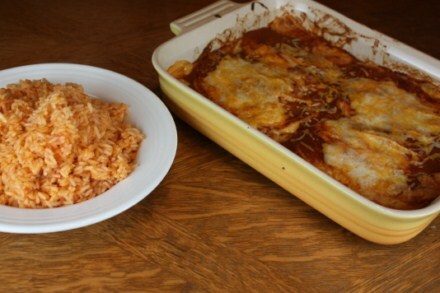 You get your kids’ new favorite dinner, easy cheese enchiladas and mexican rice. The mexican rice is a recipe that I have been making for years, but the cheese enchiladas are a new recipe. I have made cheese enchiladas before, but not quite like the ones that I made recently. I normally would take the time to make a white cheese sauce and spice it up with some onions and peppers and whatever else I was in the mood for, but for these cheese enchiladas I needed them to be really quick and easy to make. I needed a meal that would go together very quickly. My family was starving after all. All I did for these was fill corn tortillas with cheese. I used several different kinds of cheeses because that is what I had, but really just about any cheese will work. 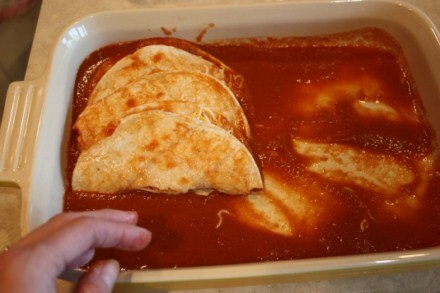 I used my homemade enchilada sauce, which I had made ahead of time since I was planning on making beef enchiladas, but you could easily use any canned enchilada sauce here. I used my fold over enchilada technique and I sprinkled more cheese on top. I baked them at 350 for about 20-25 minutes. Basically until they were heated through and the cheese was melted. Yes, that is all I did. I know it is not really a recipe, but it worked and my kids loved it. And they asked me to make it again soon. Home cooked meals do not have to be fancy or expensive. It is possible to serve healthy home cooked meals in very little time. Sometimes you have to be creative and use what you have, but you can do it. And meals like this are a perfect example. It is possible to avoid going to that fast food restaurant or ordering pizza on those crazy days. No this is not the healthiest meal that I have ever made, but it was much healthier than many of the alternatives. And yes, this is a keeping it real type of post. This is not fancy or gourmet or something that Martha Stewart would make, but it is real life. I have crazy days just like everyone else and this is one example of how I make it work. Sounds perfect and something I would do. I read a quote once: “Dinner doesn’t have to be fancy, sometimes you just have to get everyone fed”. Thanks for being real. It’s refreshing to see that others have to “punt” to get dinner on the table. I have also filled soft tortillas with canned refried beans & cheese. Then a little canned enchilada sauce. No meat & very quick! These look great and I kid you not I JUST posted requesting recipes for Spanish rice – um PERFECT! BEST. ENCHILADA. SAUCE. EVER. I have tried 2 other recipes and thrown them both out. Last night my family happily ate enchiladas for the first time in years and your sauce was the reason. Thank you for giving enchiladas back to us! @Becca, Thank you! That is so nice and I am really glad that you enjoyed the sauce. We love it and use it often. Thank you for reading! @Becca, I agree!! My husband raves about my enchiladas since I started using your homemade sauce. Thanks so much! I’m loving the foldover technique and now I’m very very hungry!! 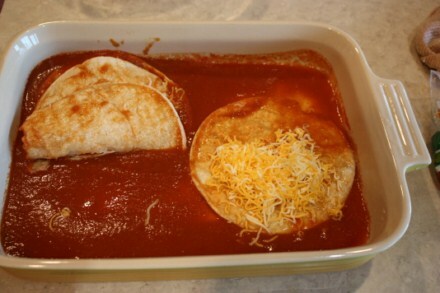 A simple recipe for cheese and beef enchiladas is to mix up the dry package of chili mix according to the directions. Add 1 lb ground beef. Dip the corn tortillas in the mixture to soften them. Place in center of your tortilla the meat mixture and then sprinkle Velvetta cheese on top. Roll these up and pour the rest of the chili mixture on top and sprinkle cheese on top. Cook at 350 degrees until hot thru. We sell lunch plates for a youth fundraiser and people just rave over them. They have no idea how simple to make. They keep begging for more. We make something very similar, but I’ll be using your sauce recipe from now on. I love the fact that it is tasty and uses basic ingredients we usually have in the cupboard anyway. I’ll mix up whatever bits of shredded cheese we have, then stir in just a little sour cream to help bind it all together. This is our dinner tonight, along with salad greens and some sliced fruit. Thanks for posting the sauce recipe, its awesome! @Jenny, Thanks! I am glad that you enjoyed it. We love it. Would you explain your onion, pepper, cream sauce you mentioned? I need real home made recipes since I live overseas and have to make all my sauces and foods.